Discussion in 'Interest Checks' started by Shadow, Sep 26, 2014. "If you could have one wish, would you risk your life for its realization?" Outside the bounds of time and space, beyond mortal concepts such as life and death, there exists Akasha, an infinite repository of all knowledge and events in the universe. More particularly, as with every soul that has existed, exists, or will exist, the records of important figures throughout the history of many worlds and times are also kept there, forever stored as proof of their existence--be it heroic or otherwise. And when this plane is breached by the Moon, they shall be summoned into the World once again to participate in the only war that can grant the impossible to the winner. A nigh-omnipotent relic that has enough power to perform Miracles--metaphysical workings of the highest order in the universe that fundamentally surpass the domain of Magic. As such, it is thought to be capable of granting any wish to its chosen holder, should it win the right to borrow the Holy Grail's power. It is an abstract, incorruptibly pure concept that has no material form, and requires a necessarily greater catalyst to bring forth its manifestation as a tangible, wish-granting force. Such is the Heaven's Feel, a ritual of godlike size and complexity that, once completed, will materialize the Holy Grail. Although the system is autonomously orchestrated by an unknown, external force, it requires the participation of seven individuals, and the subsequent elimination of all but one, who then becomes the rightful holder of the Holy Grail. And so, the Holy Grail War is set into motion. The process of elimination is, by all rights, considered a Battle Royale--it is a bloody conflict shrouded from the peering eyes of society, with each participant aiming to eradicate competition, either by defeating or killing opponents for the right to win the Holy Grail. Each selected individual, or Masters, are aided by a powerful warrior recreated from the boundless records of Akasha, the Servants, who possess superhuman characteristics and wield extraordinary artifacts or abilities known as Noble Phantasms. With a soulbound contract as their proof of alliance, both Master and Servant become a pair of viable candidates who seek and cooperate for the ultimate prize of the Holy Grail War. A world much like our own, in the sense that the primary contributing factor to the advancement of civilization is science and technology, with the paranormal regarded as something unscientific, unproven and of highly questionable credibility. Society is unknowing of the workings of Magic, and as such, practical application of Mana--along with knowledge of its very existence--remains completely unobserved in everyday life. As such, this world might be something that one could consider outwardly "normal" or "ordinary"... In truth, however, Terra is not devoid of fantastic happenings: society is merely unaware of them, with the combined efforts of several factions keeping the anomalous and the supernatural from tainting or even threatening the normalcy of humankind. Although these factions are powerful and relatively large, there exists only a limited number of individuals who can be considered as knowledgeable of Magic and similar Magiologic practices. These people, more commonly known as magi, either comprise the inner circles of organizations such as crazEcorp and the Thaumaturgic Church, or belong to small communities or families of spellcasters scattered across Terra. However small they might be, they are naturally after the relic known as the Holy Grail, with some of the most influential families of magi said to have been preparing Masters for the Holy Grail War since its first recorded occurrence. In Calescen City, the Heaven's Feel has been enacted--the Masters have already been chosen, and the time to call their Servants from beyond the axis of time is nigh. In a bloodstained game where desires and ideals clash, which wish shall prevail? Seven Masters, Seven Servants, One Grail. "While the Moon watches, the World silently knows." 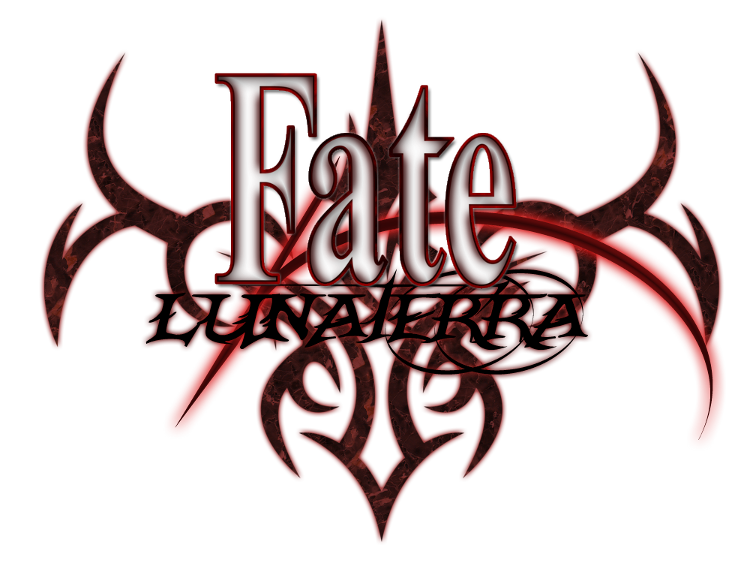 Since the plot and setting are somewhat vague for those unfamiliar with the Fateverse, I’ll explain the finer details of Fate/Lunaterra in the following paragraphs, complete with information involving the Holy Grail War, the Servant system, etc. This roleplay is based on TYPE-MOON’s Fate/ series, adapted to function in ZEJ’s Manaverse. Although basic knowledge of the Fateverse is ideal, you don’t need to have experienced any part of the franchise to participate. The basic idea is simple: roleplayers will play one of six other Masters, each of which control a Servant. These Servants are important or otherwise influential characters from across the Manaverse, who are pulled from any point in any possible timeline into Terra’s Holy Grail War to assist Masters in winning the Holy Grail. Servants are controlled by their creator, and although they are contractually bound to their Masters with Command Spells (detailed later), it is in the Master’s best interests to cooperate with their Servant whenever possible, as their thoughts and ideals might differ from their own. This bad compatibility can result in disagreements or, in the worst possible case, the death of their Master by the Servant’s own hands. Servants do not go by their proper names--instead, they use their Classes as monikers to refer to themselves and thus, conceal their identities. The identity of a Servant is a highly important subject matter, because it means revealing the exact attributes, weaknesses, strengths and potential of the Servant. The “True Name” of a Servant is a memetic trigger of information for other Servants who, by merely hearing the name, immediately recognize the parameters of the subject regardless of whether they were connected to the Servant in their lifetimes. Servants, prior to actual summoning, are given basic knowledge of Terra, to lessen cultural dissonance between the planet and their homeworlds, and to help them adapt to everyday life when needed. They are also given the necessary information about the Holy Grail and the Servant System, including their own Class, the concept of Noble Phantasms, the abilities of Command Spells, etc. Masters and Servants are bound by a high-tier spiritual contract, represented by a red-colored glyph called a Command Spell. The outward purpose of a Command Spell is a visual proof of the characters’ status as a Master designated by the Holy Grail, but their true symbolism is of the authority the Master has over their Servant. Command Spells, upon activation, enforce unconditional obedience on the Master’s own Servant, and, depending on the given order, will give them a boost of necessary power to accomplish an order which would normally be deemed impossible. For example, a Servant incapable of teleportation might be called by their Master using a Command Spell, and will leap through space to come to them. The effects of the Command Spell grow exponentially stronger the more concise the order is. Commands such as “pick up that rock” are regarded as absolute and even the most powerful of Servants will either find it extremely hard to disobey it, if they are able to at all. More general or long-term orders such as “do everything I say” have much lesser effects, and will only instill a slight compulsion that can be disobeyed or even ignored. Ultimately, the power of the Command Spell relies on three factors: the Master, the directness of the order, and the amount of energy it requires. However, as powerful as Command Spells are, each Master is only given a limited number which cannot be normally restored throughout the Holy Grail War. Each Command Spell is a three-segment glyph, typically placed somewhere along the Master’s arm, and provides the usage of three distinct Command Spells. It is of utmost importance for Masters to manage the consumption of Command Spells throughout the Holy Grail War, as depletion of all three will result in the termination of the contract between Master and Servant. While good relations with the Servant might prevent unfavorable outcomes should this happen, it is nevertheless inherently dangerous due to the possibility of the Servant rebelling against their Master. In the Holy Grail War, Masters are not the only ones who seek the Holy Grail’s wish-granting capabilities; Servants are also after the artifact, and are willing to dispose of the competition in order to obtain it. Their cooperation is founded in the basis of the Command Spell’s authority, the possibility of the Servant obtaining a wish of their own, and the fact that Servants require a steady supply of Mana from their Masters in order to maintain their very existence. Servants are maintained through the Heaven’s Feel ritual, and it is normal for them to disappear almost immediately after the Master has been killed. Disqualification of Masters from the Holy Grail War depends in two factors. The most common way is death--that is, the forceful interruption of the contract between Master and Servant, which results in both the perpetual incapacitation of the Master and the disappearance of the Servant due to lack of Mana. The second option is renouncement from the right of being a Master, which is most commonly done through the purging of their own Command Spell. It is rare for Masters to resort to that route, considering that merely killing the Servant will not abolish the Master’s right as a participant of the Holy Grail War, and it is entirely possible for them to form a new contract with another Servant. In the Holy Grail War, each Servant is assigned to one out of seven possible Classes: Saber, Lancer, Archer, Rider, Caster, Assassin, and Berserker. These Classes determine inherent abilities, such as Saber’s hallmark resistance to magecraft, and while it is exceedingly common for Servants to fit the qualifications of more than one Class, the Grail will, without exception, summon a Servant for each of the seven Classes to complete the “roster”, of sorts. Masters are, regardless of prior experience or knowledge, automatically given the necessary knowledge to perform the Servant summoning ritual, a measure the Grail takes to ensure the participation of all seven Masters and Servants. Those with sufficient knowledge of the intricacies behind the greater system (that is, the Heaven’s Feel) are able to alter the specifics of the base ritual by adding necessary components that are solely used to vastly increase the chances of summoning a specific Class, but they have no control over the identity of the Servant whatsoever. In general, the Grail will determine the Master’s Servant on a simple basis of “compatibility”, to increase the chances of cooperation between Master and Servant. Masters will almost always summon Servants that are either similar to them (either superficially or on a deeper level), or have various degrees of compatibility with them. It might not be necessarily apparent in some cases, but the Grail carefully decides on the Servant based on the Master’s own personality, thoughts, ideals, etc. Saber: The Knight of the Sword. Saber is usually regarded as one of, if not the strongest class, due to the high qualifications required for a Servant to be summoned in this Class. Proficient in close-quarters-combat and swordsmanship, they are also wielders of powerful magical resistance, and possess an additionally bolstered trait that is dependent on the Servant. As their parameters are comparatively high, they are a force to be reckoned with. Lancer: The Knight of the Lance. Lancer generally specializes in hit-and-run tactics that capitalize in both speed and range, and are skilled with weapons such as eponymous lances, as well as spears and halberds of any sort. Their Noble Phantasms are also usually classified as “Anti-Personnel”: potentially deathly against a singular target, rather than possessing outwardly destructive potential. The qualifying conditions required for this Class are considered to be second to Saber. Archer: The Knight of the Bow. Archer is not only treated as a wielder of bow and arrow- they are specialists with projectiles of any sort, and excel in possessing powerful Noble Phantasms. More so than their attributes, their strength usually lies in their strategy and tactical knowledge in conjunction with their weapons. This Class is granted the ability to act independently from their Master for a certain amount of time, even after they perish. Rider: The Mounted Knight. Rider is proficient at mounted combat, such as on an animal or any kind of vehicle. Their mounts are almost always their Noble Phantasms which, depending on the Servant, might qualify as a separate entity allied with the Master in question. Rider possesses great versatility and arguably the best mobility out of all other Classes, in and out of combat. Caster: The Magus. Caster is a powerful spellcaster or magus who sport excellent magical potential and very high Mana Pools. They are considered to have the greatest magical knowledge out of all Servants, capable of demarcating “territories” and forming magical tools when necessary, as well as possessing a wide repertoire of spells. Due to their relatively low combat attributes, they are often underestimated, which often proves to be other Masters’ downfall. They are able to detect other Servants from great distances. Assassin: The Rogue. Assassin’s primary ability is extreme and immediate methodical killing- securing the opportunity to make an effectively lethal attack. Although they are usually regarded as one of the weakest classes in direct combat, they often possess dangerous tactics that capitalize in taking advantage of the most unfair and unfavorable conditions for the enemy, which can quickly defeat Servants of even the Saber class. They are able to hide their presence from other Servants in order to maximize the effectiveness of their attacks, although this trait is diminished considerably once they are attacking. Berserker: The Mad Warrior. Berserker is a Servant whose primary trait is the exchange of its sanity and rationale for raw, destructive power. Servants of this class usually focus on overwhelming close-quarters combat, also focusing on the eradication of the target through brute force rather than tactics, magic, or special weaponry. This class can be used to strengthen the attributes of an otherwise weak Servant, or make a strong Servant nearly impossible to defeat. Ultimately, the strengthening factor is inversely proportional to the sanity lost in this exchange. Manaverse: A collective “universe” of worlds, characters, and roleplay canons all bound by the same basic principles, such as Mana Theory (and thus the same principles of magic). Holy Grail: A relic said to be nearly omnipotent, capable of defying the rules of the universe and granting almost any wish to the holder. It is the subject of bloodshed and conflict for the right to use it, which has lead into the Holy Grail Wars. It is originally just an abstract concept, but is given tangible form by the Heaven’s Feel ritual. Although it has a will, it is unknown if it is actually sentient. Further details, such as the exact location of its materialization and its true form, are also presently unknown. Master: One of seven candidates chosen by the Holy Grail, set to participate in the Holy Grail War. Masters are expected to summon Servants to fight for them, but may also support the Servant from the sidelines. Masters are almost always magi, though a few may be untrained and have summoned their Servant by accident. Servant: One of seven warriors summoned by the Masters. Servants are figures of relative importance to any civilization or world across the Manaverse, pulled from Akasha by the Heaven’s Feel ritual. Servants conceal their identities and instead use their Class monikers to refer to themselves, due to the memetic information associated with their True Name. True Name: The identity of the Servants. It is a memetic agent implanted in each and every Servant in the Holy Grail War, which only activates once they either perceive the name of the Servant, or recognize them through other means, such as by their Noble Phantasms. It is imperative for Servants to conceal their True Names, as revealing it would equate to revealing all their parameters. Noble Phantasm: Powerful armaments owned by all Servants without exception, considered to be the symbol or embodiment of the Servant. They are deeply tied to their identities, often being items the Servant has wielded in their lifetime, and are also considered the “trump card” of a Servant. They can be physical in nature, such as weapons or items, or abstract concepts like unique abilities, properties or even powerful Magic. A Servant might have more than one Noble Phantasm, up to a maximum of three. The “Noble Phantasm” statistic may not always reflect their strongest Noble Phantasm, so it might be sometimes misleading. Heaven’s Feel: The autonomous ritual that calls forth the Servants from Akasha, and designates the Masters to participate in the Holy Grail War. It is accurate to call it an extension of the Grail’s will, being merely a system designed to catalyze it. Akasha: A higher plane of existence where all the information in the Manaverse is transcribed into. It is a place no individual has been able to reach, its very existence unknown to even the most experienced and knowledgeable of magi. Somehow, the Heaven’s Feel ritual has managed to breach into this plane to borrow the Servants, but further details are completely unknown. Whew, that was quite the infodump. On a final note, Fate/Lunaterra will /NOT/ require a profile of any sort. It is only necessary to confirm involvement by submitting a brief but concise summary of your character to me via PM. Additionally, you can also send a small list (1 to 3 items) of preferred Servant Classes if the character in question is a Master, but this is not necessary. Ultimately, it will be up to me to assign all Master/Servant pairs for Fate/Lunaterra, so it is important to convey the character properly if you want the appraisal to be as accurate as my judgement can get. There are currently no applications for Servants as the secret roster is already completed, but depending on circumstances this might be subject to change. Also, it is not necessary to play a Master. Although the roleplay is centered on the Holy Grail War, non-Master characters can get as involved as Masters will in the face of the ensuing conflict for the Holy Grail, and might be even presented with the chance to become Masters themselves if the conditions allows it. So, as for this thread, aside from confirming interest I (or others familiar with the mechanics of the roleplay) will answering questions if they are any. I suppose I should post...? Would this roleplay be open to those who are unfamiliar with the Manaverse such as myself? I read through the opening post and I'm liking what I'm seeing, but I fear that my lack of knowledge would prohibit me from being accepted here. Yes. It's not necessary to be knowledgeable of the Manaverse either. All the information needed for the roleplay is right in the infodump post, and questions about specific Manaverse mechanics can be brought up as they appear. It is not a closed-group RP whatsoever, no. In fact, the intention is to open up the Manaverse to those who are unfamiliar with it, I guess. I'd love to participate if you'd have me. I don't think you'd want a Zio Character for this. As I have told @Eebit, I know exactly who I'm going to use for this. Is this coming back from the grave!!?!?!? A revival has been somewhere in roleplay hell jk they aren't a forum anymore the works for a little while, it sounds like it'll be reviving soon. Would you be interested in reprising your role from the last one? Perhaps we can finally finish our opening interaction...! You mean we're starting over from the beginning? We decided to rework the servants and not let certain people control so many characters (me and Shadow, and Nate pulled out). Which means new pairings were needed, which means we have to restart. Unless someone pulls out, the Alasdair/Assassin, Kalonia/Lancer, and Carl/Caster pairings are staying. Everyone else is up for debate though. I'm not sure about Silver and Giga having Masters as far as progress goes, but this is what I've tallied so far.